The premiere collection of inspirational figures available today. Figures of Faith™ are artistic renderings of key moments and people from Biblical times enhanced with scripture and prayer. Each sculpture is carefully detailed reflecting superior quality demonstrated by only the finest artisans. Figures of Faith provide for a meaningful gift and testament of faith. Each Figurine is Gift Boxed. 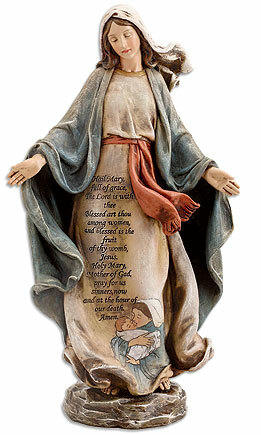 The Hail Mary prayer is printed on the front of the figure. Child of Peace Nativity Aged Hand Cast Stone Made in U.S.A.